Everyone else is doing this, so why can't I?? Don't worry-- this will be quick and dirty. Reason: Even without Sidney Crosby, the Pens are too deep to allow the Islanders to play the spoiler for their season. Reason: Despite the slipping towards the end, the Habs should be able to wear down the Sens, despite them trying to put up a good fight. Reason: Third straight odd-numbered year these two teams will face in the first round and the Caps have won both. With their new confidence, they'll find a way past King Henrik. Reason: As much of a great story as the Leafs have been, the Bruins will turn up their playoff expertise in order to get past the first round. Reason: With a big season and resting their players during the last game, the team who has been great all season should have a solid first round pairing. Reason: With the Red Wings barely getting in, the Ducks should be able to pluck off an already tired team and get their offense rolling well. Reason: Trying to exercise the demons of last playoffs, the Canucks will need to prove early and often they are a team on a mission. Reason: Brian Elliott has been on a roll this season and hot goaltending is the name of the playoff game. Plus, they feel to avenge last year's loss to the eventual Cup champs. While the average goalie in the NHL seems to be getting bigger and bigger-- this week's AGM is probably one of the first "big men" between the pipes. Standing a 6'3 and 205lbs. right-handed catch goalie, he fooled many a shooter due to his reach, "backwards" gloves, and filling the net; but thanks to happenstance beyond his control-- he never could make a mark in the NHL, but luckily-- there was an alternative. This week, the profile of Gary Kurt. Kurt started his journey to with the Kitchener Rangers of the OHL. Spending four years there, Kurt played in 57 games from 1963-64 until 1966-67 and ended with a 4.45 GAA, as no other record was available. After his junior time, Kurt played for the Central Pro League's Omaha Knights posting a 5-21-3 record in 34 games in 1967-68, while Kurt played in 25 games in the 1968-69 season (no record provided). Moving onto the AHL in the 1969-70 season, Kurt landed with the Cleveland Barons; appearing in 40 games the first season (no record) and then 42 in the 1970-71, where Kurt would finish with a 24-12-3 record, then going 4-3 in seven playoff appearances. That performance garnered Kurt a Second Team All-Star nod and allowed him to win the Hap Holmes Trophy for fewest goals-against in the AHL. Kurt finally got a jump in the 1971-72 season as the California Golden Seals took a chance and played Kurt in 16 games that season, where he finished with a 1-7-5 record for the lowly club. Conversely, Kurt also played in the AHL for the Baltimore Clippers, finishing with a 12-4-1 record in 17 appearances. After that season, Kurt moved to the new WHA in order to get a better chance. To start in the 1972-73 season, Kurt played for the New York Raiders; appearing in 36 games and posting a 10-21-0 record. The 1973-74 season saw Kurt play with the New York/New Jersey Knights and played in 20 games compiling an 8-10-0 record. Also that season, Kurt played in the North American League for 24 games on an assignment. The WHA Expansion brought the Phoenix Roadrunners into the fold, where they would select Kurt in the draft. During the 1974-75 season, Kurt played in 47 games for Phoenix and posted a 25-16-4 record and then a 1-2 record in four playoff games. In the 1975-76 season, Kurt played in 40 games with the Roadrunners and posted a 18-20-2 record, while during the 1976-77 season-- Kurt posted an 11-19-1 record in 33 appearances. 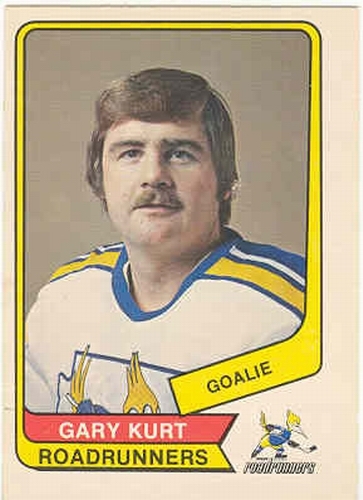 During the 1977-78 season, Kurt played only three games for the Central League's Oklahoma City Blazers (no record) before retiring from pro hockey. After a year hiatus, Kurt returned to play in the Ontario Senior League with the Cambridge Hornets for 19 games before giving up the game for good. A big goalie ahead of his time, Kurt had to deal with being put on an expansion team in the NHL; which knee-capped his career there in the big league. Luckily for him, the WHA was able to pan out to give him a memorable identity for those who followed that rival league. Yet, many would have to wonder that if there wasn't a logjam elsewhere if he could have been a solid goalie-- especially for his size. 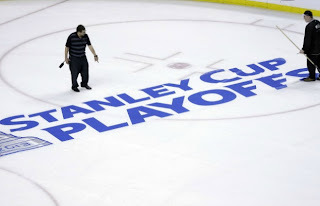 Part of me was pretty excited to see the Columbus Blue Jackets get into the playoffs. Of course, that was before the whole "Lumbus" thing which make everyone so very obnoxious. At that point, I wanted them to tank worse than any tanking from a scene out of "Patton." And GM Jarmo Kekalainen saying that he hopes people don't think they arrived at something because they hadn't-- which rekindled my enjoyment for the Blue Jackets beyond some gimmick that wore out it's welcome like so much B-Sharps. Yet, they did arrive at the point that they are a team that is to be taken seriously, which is a huge step for a team that was in the shadows of THE Ohio State University. Looking back, what the front office has done with the Blue Jackets in one shortened-season and one summer has been fantastic. John Davidson is working is magic once again by getting rid of one of the big problems in Scott Howson, despite Howson making bold moves to get rid of Rick Nash and bring in the likes of Brandon Dubinsky, Artem Anisimov, and of course-- Sergei Bobrovsky. One of the bigger moves was to snag Marian Gaborik at the trade deadline, something that showed people actually wanted to be in Columbus. More over, the move that will happen next year will be a huge one for the Jackets. Going to the Eastern Conference will help the Jackets in terms of finances and will maybe give them a better chance at making the playoffs on a consistent basis-- barring another realignment due to teams moving. Granted, they'll have to play in the same division as four current playoff teams in the East; dealing with lack of travel could make this young team a fresher team which will make them a dangerous team. Gimmicky things aside, the stir that the Jackets brought amongst hockey fans near and far was one for the ages. It was an underdog team that was all but written off and gave them life. Players who were casted away revitalized themselves, while the front office tries to repair a reputation that has been drug through the mud for a majority of the franchise's existence. The biggest thing for the Jackets now is to keep it going. Take away from this season what to do to get better next season. Granted, the test will be what a full 82-game slate will provide this team and how much endurance they have-- but from the glimpse we saw this season; there's a good chance they won't let this misstep completely derail the next season. As we see teams clinching left and right, the shortened season is showing it's effects to teams that were prepared for this sprint and those who stumbled out of the gates and it cost them. The Islanders and Leafs show the teams who knew the role the short season played and stepped up to take a playoff spot, while the Devils and Predators saw their success from previous seasons fall by the wayside. While the 48-game season has proven exciting, with some wondering if there should be a short season every few years (or every year); you have to wonder if the panic button of a 48-game season was hit too early for most teams. With little time to adjust or let a slump adjust your team's personality, the coaching staff probably tried to do too much, too soon, with guys who may have not adjusted back to the game if they hadn't been playing elsewhere during the Lockout. But, is there a way to accurately prorate were a team would be if there were 36 games added to the schedule?? It's a very out there ideal because to adjust the schedule in that extreme and give them more time, because most of the teams would have done things differently in those extra games in knowing that they were going to have time to make up the ground they lose. Conversely, you could have surprising teams who probably would have dropped off-- like if the Leafs and Islanders hadn't clinched, could they have kept up with the pace of other teams who would get those other games to improve?? There are many out there with their "fancy stats" who could probably break it down a little more with a little more time, trying to make people believe that hockey is in the exact realm of baseball where all the outside influence actually add to a players worth-- but I don't have that kind of time, patience, or care for such a thing. My basis for things is that when you look towards a middle of the season, which where we'd be at in a normal NHL season, you always have a team who was surprising in the first half get screwed over by the second half and buying into their own hype too much. Not only that, but it would have drastically changed the trade market and what teams would have needed or wanted for their certain situations. To that, you wonder if Marian Gaborik would have accepted a deal to the Blue Jackets if they were in a free fall rather than a rally in the second half of their season. Part of me would love to be able to get into trends of what could have happened in the season should it be a full 82-game slate, but the circumstances don't allow for that. The ebbs and flows of certain teams and the travel schedule, injury happenings, and general disarray that a longer season would create almost make it impossible to properly predict how some of the teams on the bubble would react to their position and how their mentality would work. But, it's always fun to banter back and forth as we look back at this season. Talking about going with a hot hand into the end of the season and into the playoffs, that's what this AGM did right out of the gate. However, through some happenstance and just mental drain, he was not able to fully have a lasting career. This week, the profile of Mike Moffat. Moffat made his mark on the junior scene starting in the 1979-80 season with the OHL's Kingston Canadians, going 7-7-1 in 21 appearances, then losing one of the two playoff appearances he had. Moffat jumped into the starting role in the 1980-81 season, playing in 51 games, finishing 33-21-3 while going 6-6 in 14 playoff games. During the 1981-82 season, Moffat played in 46 games for Kingston, pacing himself to a 19-21-4 record, then 0-1 in four playoff games. However, the peak of the 1981-82 season was Moffat's selection to the Canadian World Juniors team and being the starting goalie. Moffat would go 3-0-1 in four games on the way to a Canadian gold medal. Moffat was named Best Goaltender in the tournament and to the All-Star Team in the tournament. A draftee of the Boston Bruins in 1980, Moffat was called up after the 1982 playoffs by the Bruins and he was thrown into the cage immediately, going 2-0-0 in his two games of the 1981-82 season, then posted a 6-5 record in 11 playoff games with the Bruins. During the 1982-83 season, Moffat only played 13 games with the Bruins and put up a 4-6-1 record. The other half of that season, Moffat was with the AHL's Baltimore Skipjacks, going 5-8-3 in his 17 appearances. The bulk of the 1983-84 season saw Moffat in the AHL with the Hershey Bears, playing in 30 games and finishing with a record 8-13-4, while also going 1-1-1 in four games of action with the Boston Bruins. Staying in the AHL in the 1984-85 season, Moffat was playing for the Cape Breton Oilers and would lose the only game he played in. After that, he announced his retirement from professional hockey. Hockey wasn't done overall for Moffat, as he would go to play Canadian college hockey with Wilfrid Laurier University in the 1985-86 season, finishing with a 5-1-0 record in six games. During the 1986-87 season, Moffat took his turn at the Canadian National Team in hopes of trying out for the 1988 Olympics. Moffat went 2-3-1 in six games and did not play beyond that stint, retiring for real after that. It wasn't until later that it was made public that Moffat wasn't able to handle the nerves and pressure professional hockey brought. Moffat was homesick, dealt with insomnia, and chronic headaches. After getting out of hockey, Moffat turned to Canadian hardware store Rona, where he is an outside sale representative for the company. Moffat stills played in an Over-40 league, but never in goal. Moffat said himself that if you didn't want the job, a dozen goalies were waiting in the wings. Especially in the 1980s, it was probably much more horrifying than it is today. Though he was able to show signs of greatness, Moffat wasn't able to take the grind-- probably one of the few to actually admit that. As was with the time, this week's AGM had his career cut short due to World War II. However, in his short career, he had a lot of team and individual achievements; even though he was involved in the first biggest comeback in playoff history when he team gave up a 3-0 series lead. This week, the profile of Johnny Mowers. 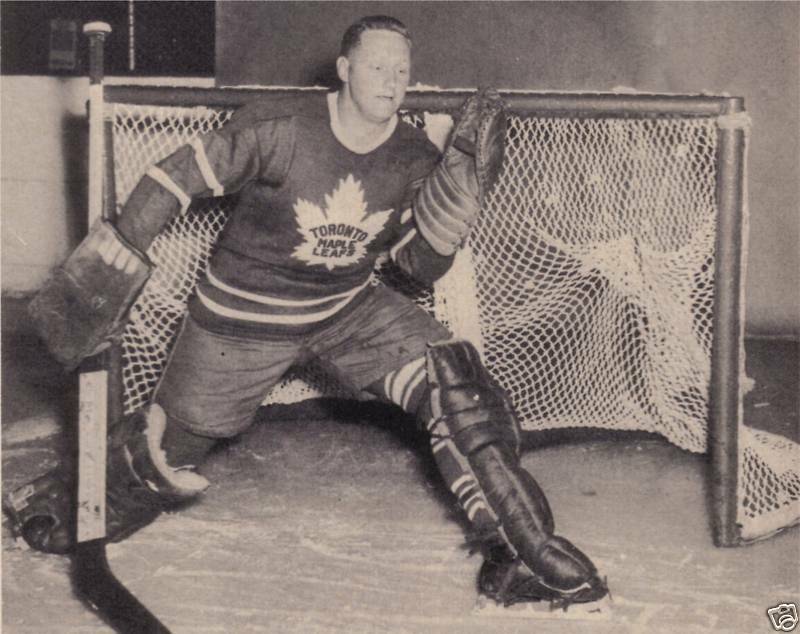 Mowers' trek is first noted when he played Senior leagues for the Niagara Falls Cataracts in the 1935-36 season, even though he would only play in the Allan Cup for two games that season. Mowers would go onto play 54 games between the 1936-37 season and 1938-39 season for Niagara Falls, as well as 16 additional playoff games; though no records are given. Before the 1939-40 season, the Detroit Red Wings would sign Mowers to a contract, but place him in the Michigan-Ontario League to start out with. While with the Detroit Pontiacs of the MOHL, Mowers played in 20 games before being promoted to the AHA's Omaha Knights, where he would play in 21 games and finish the year with a 16-5-0 record. The Red Wings would call on Mowers to start for them in 1940-41 season, starting 48 games and posting a 21-16-11 record, with a 4-5 playoff record. 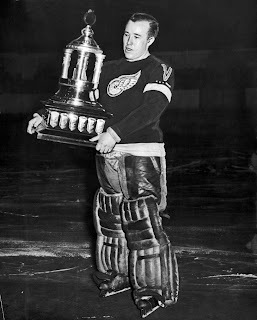 It was a little rougher in the 1941-42 season, where Mowers would go 19-25-3 for the Red Wings, but finish with a 7-5 playoff record-- one win short of a Stanley Cup. The redemption season for Mowers came in 1942-43, playing in 50 games and compiling a 25-14-11 record, then winning the Stanley Cup with an 8-2 record. In addition to the Cup, Mowers won the Vezina Trophy for top goalie, as well as making the NHL First All-Star Team. Along with some other players, Mowers left the NHL for the Royal Canadian Air Force. Mowers played with the RCAF in the 1943-44 season and would go 3-6-0 in nine games. Though he missed the 1944-45 season while serving, Mowers played for the Wembley Lions in the 1945-46 season. Mowers returned to the Red Wings in the 1946-47 season, he would only play in seven games and finish with a 0-6-1 record and was bothered by a back injury for most of the season. During the 1947-48-- Mowers played with the AHL's Indianapolis Capitols for two games, going 1-1-0 in that time before retiring due to that back injury. Not much was heard from Mowers after that and he would pass away in 1995. While having a short-span in the NHL, Mowers made a big mark in the NHL with his strong play for two of this three full seasons. Though it was cut short, Mowers did what he thought was right when he went to serve his country. Even though Mowers didn't last too much longer when he came back; Mowers will forever be remembered, if only as a footnote in the trophy department. With the Calgary Flames season in disarray, the look is to the future-- which many think is not looking too much better for the foreseeable future-- especially between the pipes. 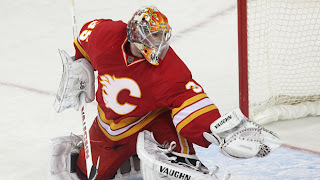 With the future of Miikka Kiprusoff up in the air with how serious he is when it comes to his retirement threats, what's to come next for the goaltendings. Enter Joey MacDonald and his audition that has been going in the past two weeks or so. MacDonald has gone 4-1-0 since March 27th in his seven appearances with the Flames and, to me, I think he's at least garnered another contract for at least next season to be in a 1A/B model for the 2013-14 season for the incoming European goalies-- or as a back-up for Kiprusoff should he not stick to his retirement talk. MacDonald has been a somewhat serviceable back-up or third string goalie, though his numbers tell a different tale. Despite being 7-6-1 overall for the Flames, the fact he has been playing better as the team has been getting somewhat better is a definite good sign for things moving forward. Plus, considering the fact MacDonald has been known to linger on the bench for long stretches at a time-- should Kipper come back, he'd be one of the best choices for a back-up as any of their younger guys or European import. Taking into account that Kiprusoff won't be back-- what could the Flames do with their prospects coming over for next season. Karri Ramo has been highly regarded by GM Jay Feaster as the best goalie not in the NHL, but while he has done well in the KHL-- it doesn't mean it'll always translate to the NHL game. Same goes for the other European goalie in Reto Berra, who has done well in the Swiss league, but may not be able to thrive in the NHL or North America as a whole. Already in their system is Danny Taylor, who was signed by the Flames when Kipper went down with an injury. Taylor overtook the starting role in Abbotsford of the AHL from Barry Brust, who was hot for Abbotsford early in the season, but Taylor has taken the NHL experience and stepped his game. So much so that the once promising prospect in Leland Irving has been relegated to third-string in Abbotsford and very much off the radar for the Flames. With all this uncertainty, it definitely makes a strong case for MacDonald to actually get another shot with the Flames. He's the devil that is known and can actually get the job done on a team that may not know or understand it's new identity. MacDonald is having a strong stretch run and if Feaster just let's MacDonald get away in hopes that the imports without contracts and who have been out of (or not been in) the NHL for a while will be a better option-- then he deserves to be tarred-and-feathered after his firing. "It may be the right decision, but he's not doing it for the right reasons." That was the parting comment from Dan "Boomer" Molberg when it came to the discussion about whether or not it is right that Boston College forward, Hobey Baker Finalist, and Flames draft pick John Gaudreau is sticking around Boston College for another season rather than signing with the Flames and moving along his professional career. While that comment pretty much sums up the discussion, the fact former Flames defenseman and morning show co-host Rhett Warrener claimed that Gaudreau was "scared" to come out of college to play for the Flames is what took people a little off-guard. Warrener's points of him not going to get much bigger than his listed 5'6, 141lbs. frame, as well as having the best chance right now for making the Flames roster and getting top-six minutes are very valid; the fact he used "scared" right off the back when the talk came up is what maybe made him come off a little too harsh. Third co-host Andrew Walker was trying to defend the decision saying that Gaudreau may not be ready-- his comment was brushed back by Boomer and Warrener saying he had nothing more to achieve in college, considering he has a National Championship, was the leading scorer, won the Beanpot, and could win the Hobey. Walker tried to draw comparisons to other small BC alum like Nathan Gerbe and Brian Gionta waiting another year, but Boomer and Warrener brought up he may just want to stay because his brother was coming onto the squad next season as well. Most certainly, the points that Boomer and Warrener were making are very solid and correct, the term "scared" being thrown out there without prior knowledge to what his clear mindset is for staying at BC is a little heavy-handed. It's something that could actually be a better decision if he doesn't think he can cut the workload for the NHL schedule and the competition that comes with it, especially with his size. Staying in school and actually getting a degree could be a better fit in Gaudreau's mindset rather then playing in the NHL. Notwithstanding the reasoning, it could be a bit alarming for the Flames' brass to hear about this decision being made. Gaudreau has already done all he could with his college career and him balking at taking the next step in a full rebuild where he could learn on the fly and adapt to the NHL game without really hurting the team's fortunes could be the best route for him to grow as a player on the job. As he is considered one of the Flames top guys coming up the pipe, it's not something you want to hear for a guy who has done it all as an amateur. Despite that, to assume that a player is feeling one thing or another without having an inside track about it is something that's not really journalistically responsible. Even if it came from a former player who may have his own values in his head on how ready a guy may be; doesn't mean he's "scared." Of course, if Gaudreau's not ready to take the next step even with all his accomplishments and maybe all the confidence in his abilities, that should throw up some warning signals about what may happen with his NHL career when he actually gets there. Another week and another move in the AHL. 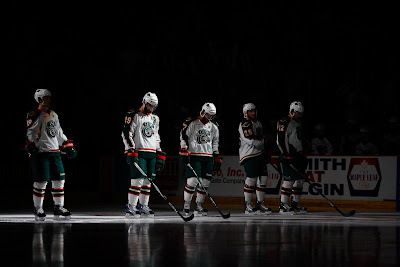 According to the Star-Tribute (via Hockey Wilderness), the Minnesota Wild will uproot the Houston Aeros and move them to Des Moines, Iowa. The Wild have been unable to come to an agreement with the Toyota Center regarding a new lease for the Aeros, so they are moving to the Hawkeye State's capital. With the Houston Aeros, it's a name that has been around since the WHA day of Gordie Howe and made a revitalization during the IHL years and moved over to the AHL during the absorption of the IHL. 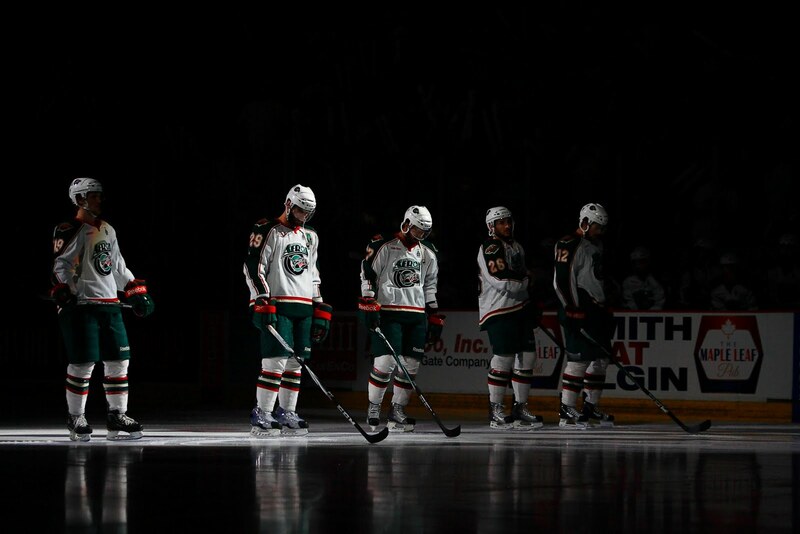 Not only that, but the fans have taken to the Aeros, as they rank 7th in the AHL in attendance this year and have been in the top-third of the attendance chart over the past few seasons. Moving the team is pretty interesting, especially considering they are in a big city and it is easier to get call-ups; like was stated in the HW piece. As far as Des Moines goes, this is a city that had hockey from 2005 until 2009, first as the Iowa Stars from 2005 until 2008, then as the ever memorable Iowa Chops in the 2008-09 season. In an arena that has over 15,000 capacity for hockey, Iowa's highest average was over 5,100 in the 2005-06 season, then went downhill from there. Of course, this will be Iowa's closest parent affiliation they've had, which could draw road trips from Wild fans to see the next guys to come up to the MSP area. Though, what does it mean for the Houston area and their loss of a hockey team?? To be honest, if there's an ownership group willing to hammer something out with the Toyota Center, the Central Hockey League may be the prime destination. With the CHL expanding to St. Charles, Missouri and Brampton, Ontario for 2013-14, it only seems right for them to move to a league with heavy ties to the South/Midwest. Who knows how this will turn out for the Wild. If the move to Des Moines helps rejuvenate that market, then it's a smart move for them in the long-run and allows them to actually be able to keep a very close eye on them. Of course, if this doesn't work-- then many will wonder if the move was all worth it, especially if they have to move out of Des Moines after a few seasons. As greatness retires, it's always big shoes to fill. This week's AGM is one guy who didn't get the chance to make his mark after a legendary goalie because he didn't develop fast enough in the minors. While he did make a name in the minors, his short time in the NHL is something he would probably want to actually make up for. This week, the profile of Rob Holland. In the 1974-75 season, Holland started playing in Junior A with the Longueuil Lions; where he would play for 36 games. Moving up to the QMJHL's Montreal Juniors, Holland played 37 games in the 1975-76 season, finishing with a 17-16-2 record, then 2-4 in the playoffs. For the 1976-77 season, Holland stayed with the Juniors and went 17-21-3 in 45 games before going 4-7 in 13 playoff appearances. The Montreal Canadiens selected Holland in the 4th Round of the 1977 Draft and for the 1977-78 season, placed him in the AHL with the Nova Scotia Voyageurs, where Holland would finish with a 13-14-11 record, as well as finishing with a 2-3 playoff record. Back in Nova Scotia for the 1978-79 season, Holland played in 43 games and posted a 18-19-2 record, while losing his only playoff appearance. Holland and Maurice Barrett would share the Hap Holmes Award for fewest goals against in the AHL. With Ken Dryden retiring, and Holland not progressing as the Canadiens had thought; the Habs sent Holland and Pat Hughes to the Pittsburgh Penguins for Denis Herron and a pick. For the 1979-80 season with the Penguins, Holland played in 34 games and finished with a 10-17-6 record. In the 1980-81 season, Holland bounced around-- playing for the Penguins for 10 games (1-5-3), then moved to the AHL with the Binghamton Whalers for seven games (1-4-0), and landed finally in the Central League with the Indianapolis Checkers for 15 games (6-6-2). In the summer of 1981, the Penguins traded Holland's right to the New York Islanders, but Holland spent the 1981-82 season with the Indianapolis Checkers, playing in 30 games and compiling a 15-11-1 record, being a part of the Adams Cup winners with the Checkers, and sharing the Terry Sawchuk Trophy for fewest goals-against with Kelly Hrudey. 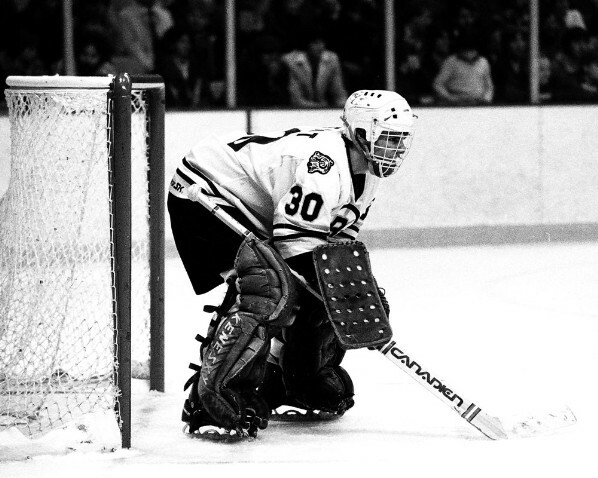 Also in 1981-82, Holland spent seven games with the IHL's Toledo Goaldiggers. During the 1982-83 season, Holland returned to Indianapolis and played in 38 games; finishing with a 24-11-1, then 2-1 in the playoffs on his way to a second straight Adams Cup championship, as well as a second straight Terry Sawchuk Trophy with Hrudey. Holland returned to Indianapolis in the 1983-84 season, but the record didn't go with him through history. However, as the Checkers moved to the IHL, Holland did too-- playing in 57 games during the 1984-85 season and sporting a 23-29-3 record. In the 1985-86 campaign, Holland played in 39 games for Indianapolis (conflicting records provided), as well as moving to the AHL's Springfield Indians for eight games and finished there with a 6-2-0 record. Finally in the 1986-87 season, Holland moved to the Milwaukee Admirals of the IHL and played in 66 games in the regular season and six in the post-season. After that season, Holland would retire from hockey. While he had the chance to follow in the footsteps of the legend, his team didn't believe in Holland's abilities to take over the workload. When he did get his chance, Holland wasn't on the right team with the support he could need. While he did gang-busters in the minors, he was never able to get back to the pinnacle of the NHL after his cup-of-coffee. While the Trade Deadline was pretty much a dud except to the last hour, I have to say something that was more annoying than the lack of movement was the people complaining about the over-covering of the deadline, knowing that it'd be very slow. Even with it being very slow, what does it matter-- it leaves more time for things to breathe and more people to actually talk rather than a select few and then having to cut them off to get reactions from management or the traded players themselves. Hell, the all-star casts that both TSN and Sportsnet had was something to keep me tuned in, even if some of the things they had were very inane and unnecessary on a day like this. Granted, having a show that goes from 8 AM Eastern Time until 5 PM is a bit insane, regardless of how busy the day might possibly become. Notwithstanding, you have to realize that sometimes the tradition is hard to actually kill off or actually tone down. With sponsors and analysts and all kinds of special people going into the studios to give their two cents to the situations, you almost need all that time in order to justify their presence or just travelling them up there in the first place. If the show was truncated to 1 PM to 5 PM, it would be too short for some people. 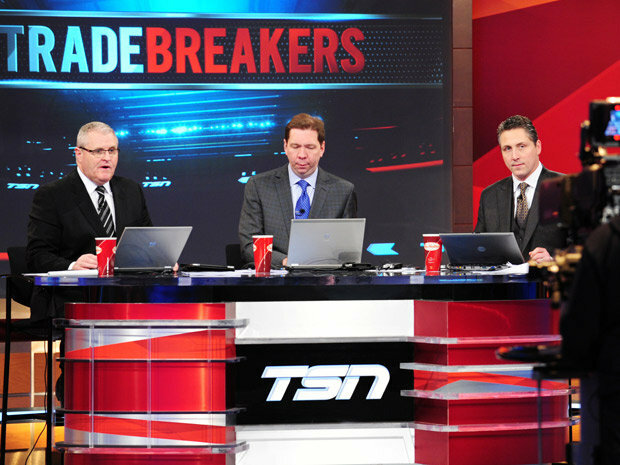 While that would have been the perfect timing for this year, you can't always predict it and you can't change something on a dime like that when you have sold the advertising space and actually got in-show sponsors to give up their money in order to present the show and have their brand all over the place-- like Tim Horton's mugs everywhere on the TSN set. The best part about having the coverage as it is has to be the fact you can see the person on the TV and have them rely true or false information. With Twitter being the crapshoot as it is, many have been duped by fake accounts of real people, fake insider accounts, and just other craptasticness on the internet. With those talking heads actually being accessible for an extent amount of time on the TV, they can almost instantaneously shoot down the false information or confirm it was actually them saying it. Despite the coverage being overkill and going to some things way more than they should have with way more people than a company should have had up there-- it was a success for both sides of the ball. 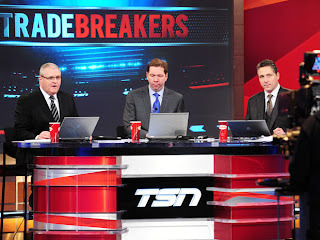 Many tried-and-true people stuck with TSN, as it seems to the gold standard for shows like this with their connected insiders and cast of analysts; but Sportsnet did have a solid panel with their Strategy Room being another great gimmick, as well as the inclusion of Greg Wyshynski to break up the monotony of serious and sometimes hypothetical talk about what possible trades could come. There's definitely something for improvement when it comes to timing and how much air-time should actually be given in times like this-- but the more hockey that is on TV, game-play or otherwise, is never a bad thing and it engages some people into discussions and situations they may not have thought of when socially networking with others online. With little jobs during the Original Six era for goalies, the need for longevity was a must. This week's AGM was an unlikely source for being that longevity-- a record that actually still stands with the team's history today. This week, the profile of Ed Chadwick. Starting in the 1950-51 season, Chadwick played in the OHA-Junior league with the St. Michael's Majors and would play there for three seasons until the 1952-53 season in a total of 135 regular season games and 24 playoff games (13-11). Also during the 1952-53 season, Chadwick played with the AHL's Pittsburgh Hornets for a game, which was a win. Chadwick spent two games with the Hornets during the 1953-54 season going 1-1-0, but would also spend time with the OHA-Senior league's Stratford Indians for four games. During the 1954-55 season, Chadwick spend the majority of the year with the Sault Ste. Marie Greyhounds of the NOHA, playing 38 regular season and 14 playoff games (no records given); plus Chadwick spent two games with the AHL's Buffalo Bisons, posting a 1-1-0 record. During the 1955-56 season, Chadwick spend the majority of the season with the Winnipeg Warriors of the Western Hockey League, compiling a 39-27-2 record in the regular season and a 16-4 playoff record, helping the Warriors to the Lester Patrick Cup as league champions and Edinburgh Cup as top minor professional team in Canada. 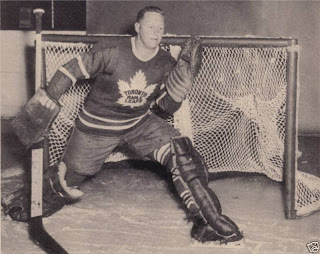 During the season, Chadwick got a chance to move to the NHL with the Toronto Maple Leafs when Harry Lumley went down to injury. 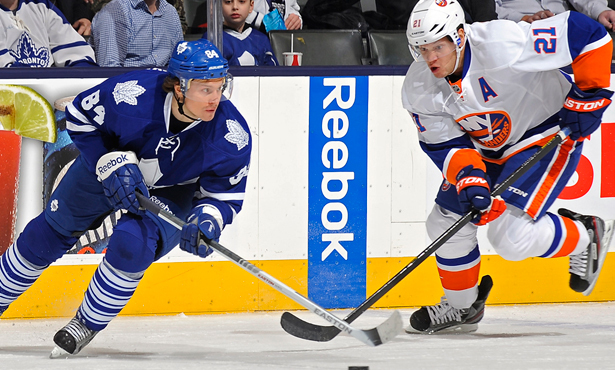 In five games, Chadwick finished with a 2-0-3 record with the Leafs. Chadwick stayed up with the Leafs in the 1956-57 season, playing in all 70 games and finishing with a record of 21-34-15. In another full 70-game season for Chadwick in 1957-58, the record at the end would be 21-38-11. Those 140 consecutive games is still a Leafs record to this day. During the 1958-59 season, Chadwick only played 31 games for the Leafs and would finish with a 12-15-4 record, while in the 1959-60 season, Chadwick posted a 1-2-1 record in four games. The bulk of the 1959-60 season, Chadwick was sent to the AHL's Rochester Americans, playing in 67 games and finishing with a 39-24-4 record and then 5-7 in the playoffs. Chadwick would received the Hap Holmes Trophy for fewest goals-against in the AHL and was on the AHL First All-Star Team. Returning to Rochester in the 1960-61 season, Chadwick finished with a 32-35-4 in 71 games. Chadwick moved to the Kingston Frontenacs for the 1961-62 season, playing 67 games and finished with a 36-23-8 record, then going 6-5 in the playoffs. During that run, Chadwick was traded from the Leafs to the Boston Bruins for Don Simmons, and Chadwick would play four games and put up a 0-3-1 record. In the summer of 1962, Boston traded Chadwick with Barry Ashbee to the Detroit Red Wings for Bob Perreault. Chadwick never played in Detroit, being sent right to the Hershey Bears of the AHL for the 1962-63 season and had a 34-26-7 record in the regular season with an 8-7 record in the playoffs. Back in Hershey for the 1963-64 season, Chadwick went 31-22-5 in 57 games and 3-3 in the playoffs. The Bears would traded Chadwick to the Chicago Blackhawks in the summer of 1964, who would place him with the Buffalo Bisons in the AHL for the 1964-65 season; where Chadwick would finish with a 33-21-6 record, then 5-4 in the playoffs. Chadwick's time would decrease significantly in the 1965-66 season, playing in only 34 games and finishing with a 14-18-1; while in the 1966-67 season-- Chadwick posted a 5-23-2 in 36 games. Finally in the 1967-68 season, Chadwick only played in 18 games and put up a 5-8-1 record and would retire at the end of the season. After his career was done, Chadwick took some time away, but would reappear as a scout for the Edmonton Oilers. While with the Oilers, Chadwick would be apart of five Stanley Cup teams with the Oilers (1984, 1985, 1987, 1988, 1990) and has his name on the Cup three times with the 1985, 1987, and 1990 teams. Being put in the place of a future Hall of Fame goalie in his first job, the pressure was on Chadwick and while he did what he could with the teams that were in front of him, he wasn't able to get the break he may have deserved because of the limited jobs available during his prime. While his minor-pro days do have many bright spots, his NHL time wasn't as splendid for him-- even though he has been able to keep that "iron man" record in net alive to this date.